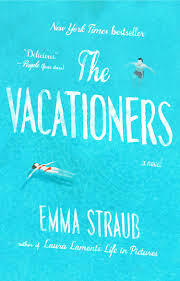 a book chick: "The Vacationers"
my take: Dysfunctional family goes to Mallorca. Food, pool, sun, beach, Spanish men and scenery. Definitely a great escape novel and also an insightful look into each of the characters lives and motivations ... high school graduate who can't wait to leave her parents, late twenty-something whose life is going no where, about to be empty-nesters in a relationship crisis, a gay couple trying to adopt ... lots of emotional issues to solve on the beautiful island. It's one of those great fun, female, fiction reads with substance. Love. my source: Saw on Instagram feed many months ago .. finally got it in paperback. Worth the wait! Excellent... bringing this one along on this weekend's little vacation!